Complete MUH collection from 1957 2/- Map to 2006 Fish set, plus some additional Decimal issues including 1966 Definitive POP (2) in Seven Seas Hingeless album with slipcase. Largely complete MUH collection from 1957 2/- Map to 2014 Homeward Bound set on Seven Seas pages. 1961 2/3 Penguin FU. Face Value of Decimal issues $151.00. Complete FU collection from 1957 2/- Map to 2012 Antarctic Expedition set, including odd MUH and duplicate item in Seven Seas Hingeless album. Many recent issues CTO. Complete MUH collection from 1958 QEII Definitive set to 1992 Christmas strip of 5 in Seven Seas Hingeless album. Face Value $196.20. Largely complete MUH collection from 1958 QEII Definitive set to 2013 Christmas set on Seven Seas pages. 1958 QEII Definitive and 1968-70 Fish sets FU and few early issues MLH. Face value of MUH stamps from 1976 onwards $375.00. Accumulation of MUH Decimal issues from 1963 to 1989, including numerous sets and miniature sheets, with varying duplication. Face Value $1,165.00. Accumulation of MUH Decimal issues from 1969 to 1993, including numerous sets and miniature sheets, with varying duplication. Face Value $1,315.00. Complete MUH collection from 1963 Definitive set to 1993 Festive Season set, including 1990-91 Provisional overprints set of 7 in Seven Seas Hingeless album with slipcase. Face Value of Decimal issues $192.00. Largely complete MUH collection from 1963 Definitive set to 2013 Barrel Mail set on Seven Seas pages. 1963 Definitive set FU and excludes 1990-91 Provisional overprints set of 7 and several recent issues. Face Value $304.00. Accumulation of MUH Decimal issues from 1966 to 1994, including numerous sets and miniature sheets with varying duplication. Face Value $517.00. Largely complete MUH collection from 1947-59 Ball Bay set of 14 to 2006 Christmas set in Seven Seas Hingeless album in 2 binders with slipcases. Odd minor blemish. Face Value of Decimal issues $670.00. Largely complete MUH and FU collection from 1947-59 Ball Bay set of 14 to 2013 Country Music Festival set on Seven Seas pages. Majority FU to 1976 Christmas set including odd MLH issue. Face value of MUH stamps from 1977 onwards $868.00. Largely complete MUH collection from 1979 Death of Cook set to 2012 QEII Diamond Jubilee M/S in Seven Seas Hingeless album in 2 binders. Face value $863.00. Accumulation of MUH Decimal issues from 1966 to 2007, including numerous sets and miniature sheets with varying duplication. Face Value $2,302.00. Post Office presentation folder containing various CTO and MUH issues including Nauru 1954 Definitive set CTO with gum, Norfolk Island 1953 Definitive set CTO with gum and Papua New Guinea 1952 10/- Map and £1 Fisherman O/P 13½mm Specimen MUH. Australian Territories, Papua New Guinea and Pacific Islands. Accumulation of MUH stamps and miniature sheets from 1977 to 1994 comprising Christmas Island, Cocos (Keeling) Islands, Nauru and Norfolk Island (Face value $1,005.00), Papua New Guinea (Face value K384.00) and Fiji, Pitcairn Islands and Samoa (Face value $810.00). Includes numerous sets and some duplication. 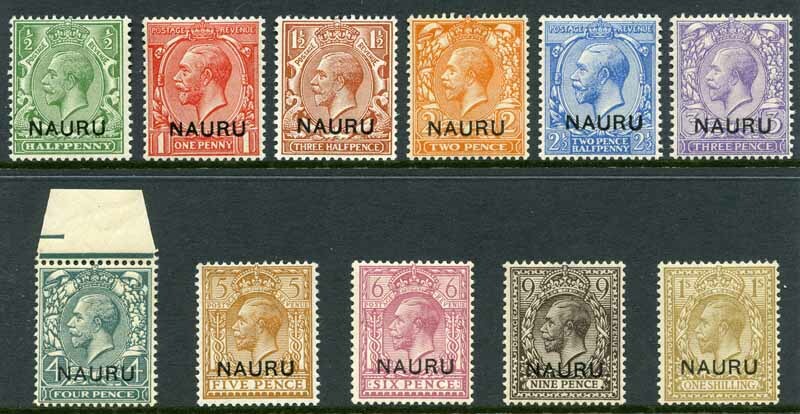 Collection of MUH Christmas Island (Face value $79.84), Cocos (Keeling) Island (Face value $90.77), Nauru (Face value $77.07), Norfolk Island (Face value $130.99), Fiji (Face value $84.98), Samoa (Face value $176.14), Papua New Guinea (Face value K79.88) and Pitcairn Islands (Face value $84.57) from 1977 to 1988 including many sets and miniature sheets. Odd duplicate. Also British Commonwealth 1981 Royal Wedding collection of MUH stamps, miniature sheets and booklets. 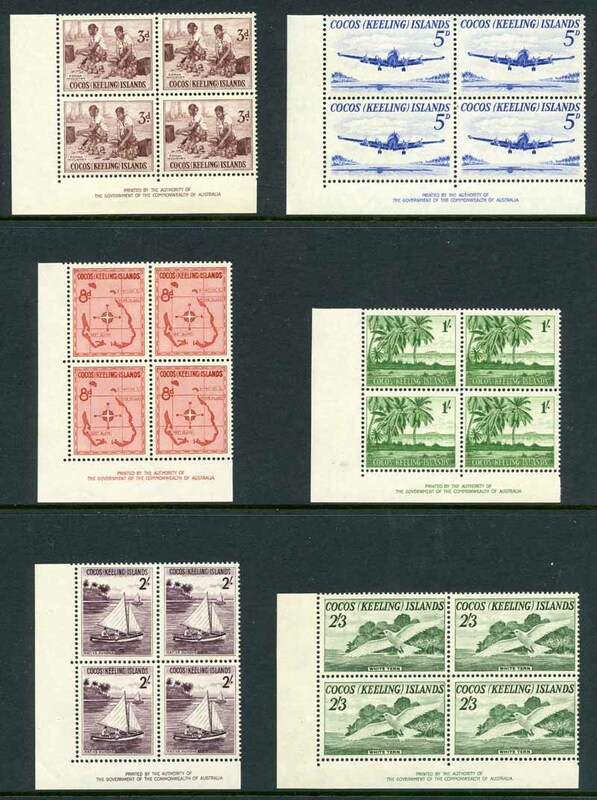 Accumulation of MUH stamps from 1966 to 1986 comprising Christmas Island, Cocos (Keeling) Island, Nauru and Norfolk Island (Face value $494.00), Papua New Guinea (Face value K195.00) and New Zealand, Fiji, Samoa, Niue, Pitcairn Islands and Tokelau (Face value $368.00), plus 1977 Silver Jubilee collection of MUH stamps and miniature sheets. Includes many sets and some duplication. Also bundle of mostly Australian FDC's, PSE's and postal stationary items and collection of Foreign stamps in 6 Globe albums and packet.